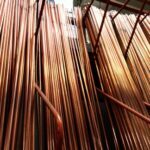 If you need to work on a faucet or fixture, or shut off the water to your entire house, this article will show you how. 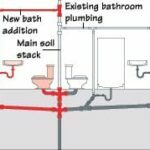 Includes how to turn off the water supply to individual fixtures such as sinks, shower, or tub, or to the whole house. 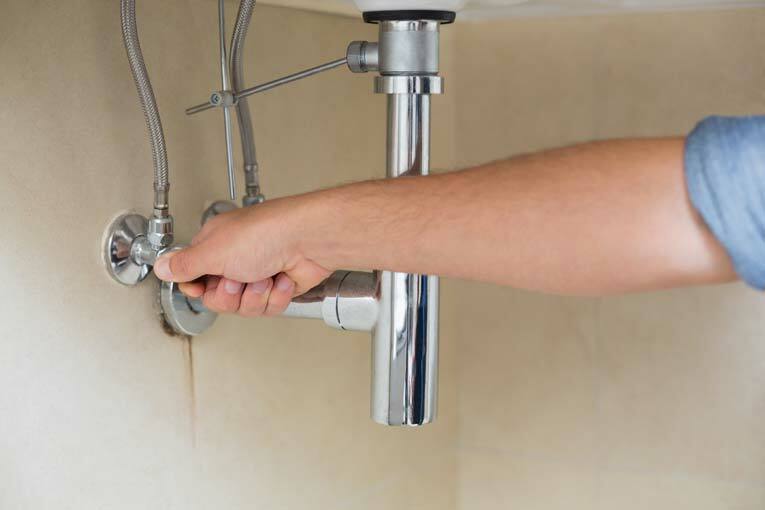 When a home’s water supply system leaks or a repair to one of the plumbing fixtures is needed, you’ll have to shut off the water. It’s best to do this at the valve that’s closest to the problem. That way, the rest of the house will still have a functioning water supply. The water-using fixtures and appliances in most homes built since the 1950s have a shut-off valve that allows you to stop the water supply at the fixture without shutting off the water to the entire house. 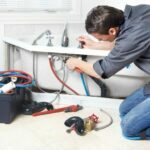 If you need to work on a faucet, shower, or tub that isn’t served by a shut-off valve, you may need to shut off the water to the entire house in order to work on it. Look for a two chrome-plated or plastic stop valves under the sink, usually at the back of the cabinet. These are connected to the water supply tubes that serve the faucet—one for cold, and the other for hot. The cold is usually on the right-hand side. 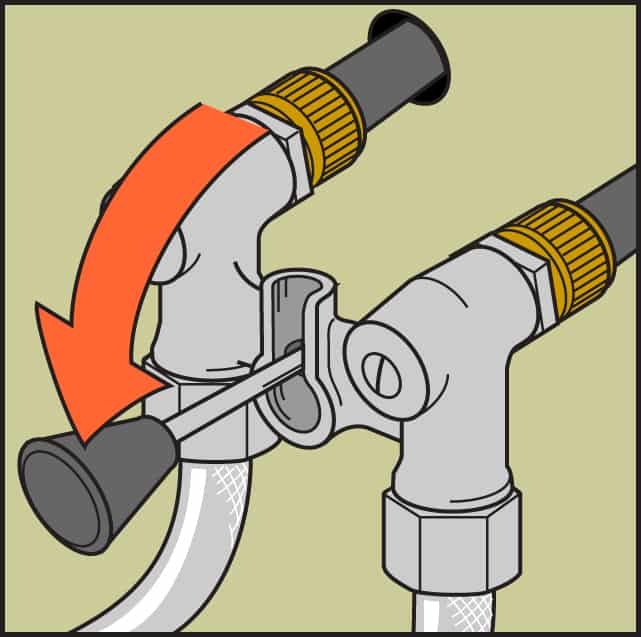 Shut off water to a sink faucet by turning the small valve beneath them clockwise. To work on a single-handle faucet, you will need to turn off both. Standard valves are like a faucet—turn the handle clockwise to shut off the water. 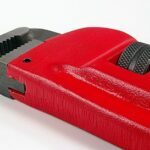 If the valve is too difficult to turn by hand, try wearing a work glove, or grip the handle with a pair of slip-joint pliers. Newer types of stop valves have a small lever that you twist a quarter turn clockwise to turn off the water. 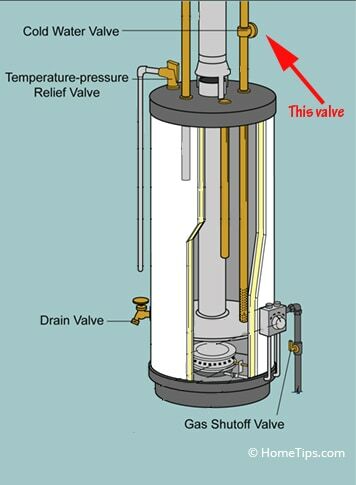 Water heater supply valve shuts off the cold water that is delivered to the water heater. This may be a lever or a regular circular-handle valve. Lever valve controls supply to this water heater. Note the red main supply valve in the background. If it is a lever, pull it 90 degrees from its open position. If it is a circular valve, turn it clockwise until it is closed. Lever shuts off the water supply with this type of washing machine valve. To shut off the water supply to a washing machine, just turn off the valve behind the machine clockwise. Many washers are served by two valves that look like outdoor hose valves—one for hot and the other for cold. Hot is usually on the left. They work just like outdoor valves. Some washers have simple lever-style washing machine shutoff valves like the one shown here. Just pull the lever down, as indicated, to shut off the water to both hot and cold. The house’s water shutoff valve is usually located just outside (or, in climates where freezing is a problem—inside) an exterior wall. 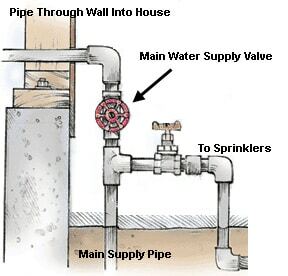 If you don’t find a shutoff valve near a fixture, you can shut off the valve that controls the flow of water to the entire house, normally located near where the cold water pipe enters (the valve will be outside in warm climates, inside in cold climates). 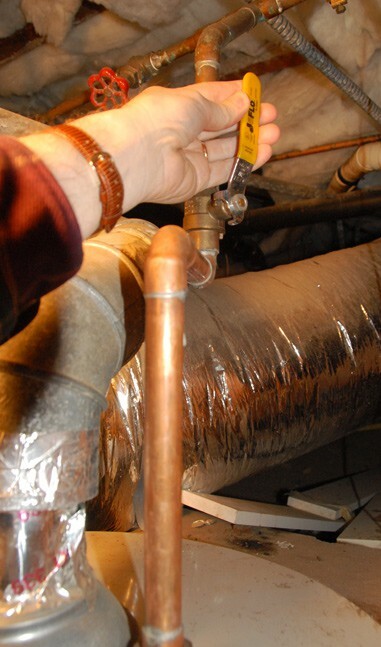 In some cases, the valve is located on a pipe right before the water heater and may have a red handle. To turn it off, rotate the handle clockwise. To turn off the water to your house and the rest of your property (including outdoor sprinkler systems, hose bibbs, and so forth), look for the main valve just to the house side of your water meter. This is normally out by the street, often in a concrete box just below ground level. 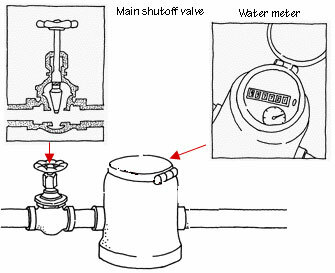 The main water shutoff valve us usually located near the water meter. This should shut off water to your entire property. 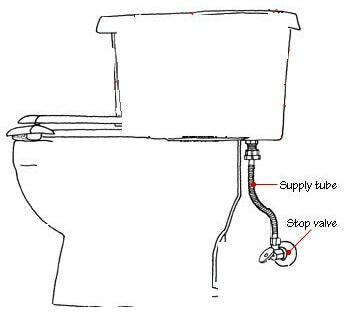 Once you locate the valve handle, turn it clockwise until it stops. 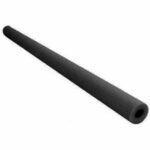 If it is frozen in position, put a few drops of lubricating oil around the valve stem and wear a work glove to turn the handle or, if necessary, turn it with the help of a pipe wrench. This valve should always be completely open or completely closed—never used half open to control the amount of flow into the house. It isn’t designed to be left partially open.